These instructions are for distributing an iCal feed for your Calendar Module calendar, which may include events that are not intended to be visible to non-users e.g. staff leave, events with visibility turned off, etc. This functionality is therefore intended to be only be made available to your ChurchSuite account users (not church members, or web visitors). This iCal feed has the identical functionality as Calendar Embed, and will only include events marked as "Show in Embed" in the event visibility settings. It also excludes system events such as holidays and leave. Note, however, for multi-site churches, this is an 'all sites' feed; it's not currently possible to subscribe to a site-specific public church calendar. 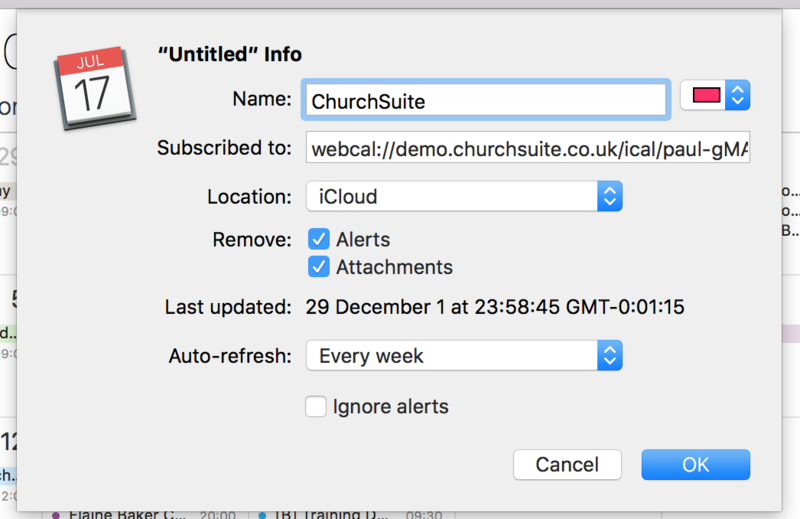 ChurchSuite's Calendar module is a fantastic tool that lets you easily plan events that are happening in the life of your church, organise holidays and leave for your users and so much more. You can set it up so that your phone or computer automatically pulls in the events that you've created within your ChurchSuite calendar, so regardless of the device you're always up-to-date with what's going on. Additionally, if you use the Bookings module, you can also see unlinked Bookings in the iCal feed or Google calendar subscription. Note that linked Bookings (i.e. 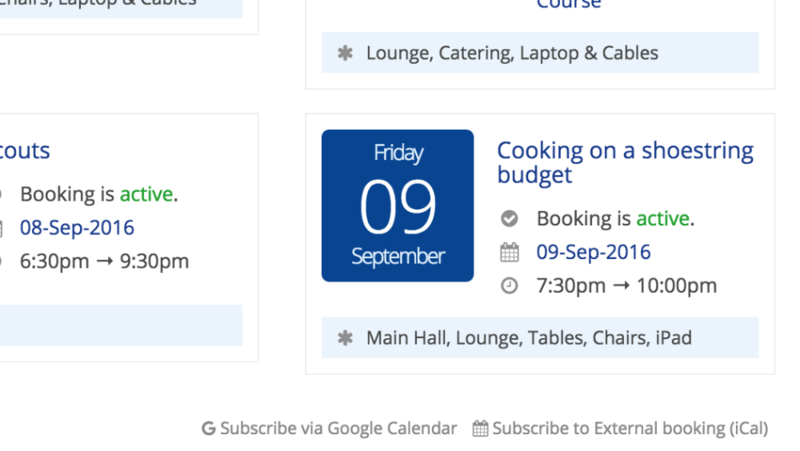 Bookings linked to an event in your calendar) are not shown since the event is shown instead. However, for any unlinked Bookings that have the "Show in Calendar?" option selected, these will be included in the iCal feed and Google calendar subscriptions. Bookings with "Show on calendar?" 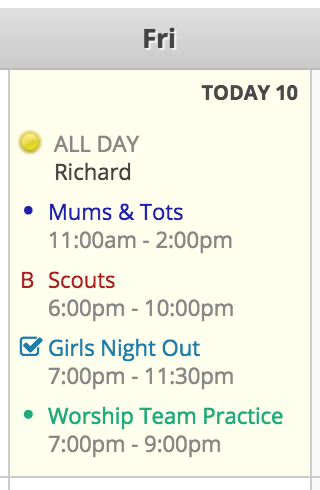 enabled are indicated by a "B" symbol on your ChurchSuite calendar. We have included instructions for two of the most popular online calendars, the Mac calendar and the Google calendar. Let's get started! Begin by going to the Calendar module in ChurchSuite. Next, scroll down to the bottom of the page and click "Subscribe to feed (iCal)". Mac Calendar will ask you to confirm you want to create the feed subscription. You can then name your subscription and set how often you wish it updated. Once you're happy with your selected settings, click "OK". That's it - you're done! Your calendar will automatically refresh as you add new events in through ChurchSuite. As with the Mac calendar, begin by going to the Calendar in ChurchSuite. Then, scroll down to bottom of the page and select "Subscribe via Google Calendar". ChurchSuite will now open your Google Calendar in a new browser tab (you may be asked to log into Google Calendar). 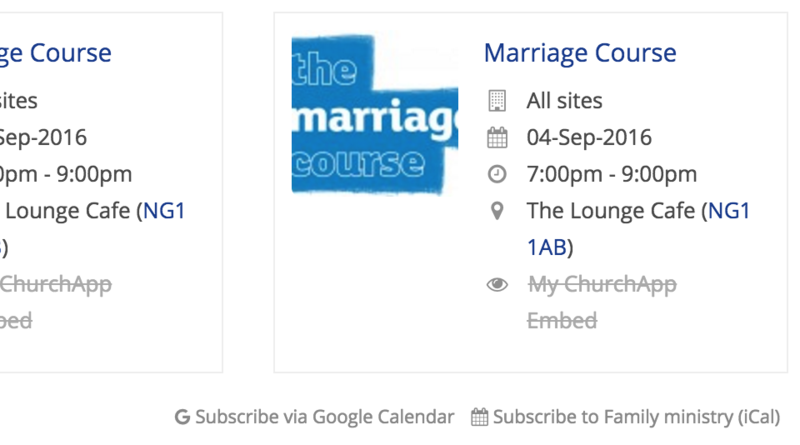 A confirmation message gives you the option to now add your ChurchSuite calendar to your Google calendar. The calendar subscription automatically refreshes every 24 hours. Go to Calendar > Leave. Scroll down to the bottom right-hand corner of the list of leave entries. Select 'subscribe' from there. Go to Calendar > Categories. Select a category and scroll to the bottom right-hand corner of the category event list. Select 'subscribe' from there. Go to Bookings > Bookings. Scroll to the bottom right-hand corner of the booking list. Select 'subscribe' from there. Go to Bookings > Types. Select a booking Type. Scroll down to the bottom right-hand corner of the list of bookings within that Type. Select 'subscribe' from there.